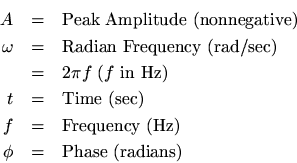 The term “peak amplitude” is often shortened to “amplitude,” e.g., “the amplitude of the sound was measured to be 5 Pascals.” Strictly speaking, however, the “amplitude” of a signal is its instantaneous value at any time . The peak amplitude satisfies . The “instantaneous magnitude” or simply “magnitude” of a signal is given by , and the peak magnitude is the same thing as the peak amplitude. Note that Hz is an abbreviation for Hertz which physically means “cycles per second.” You might also encounter the older (and clearer) notation “c.p.s.” for cycles per second. i.e., . You may also encounter the convention .